BROWNSVILLE — The Port of Brownsville was recognized with two prestigious 2018 AVA Digital Awards for design and content of its website and electronic newsletter. The AVA Digital Awards is an international competition recognizing excellence by creative professionals responsible for the planning, concept, direction, design and production of digital communications. 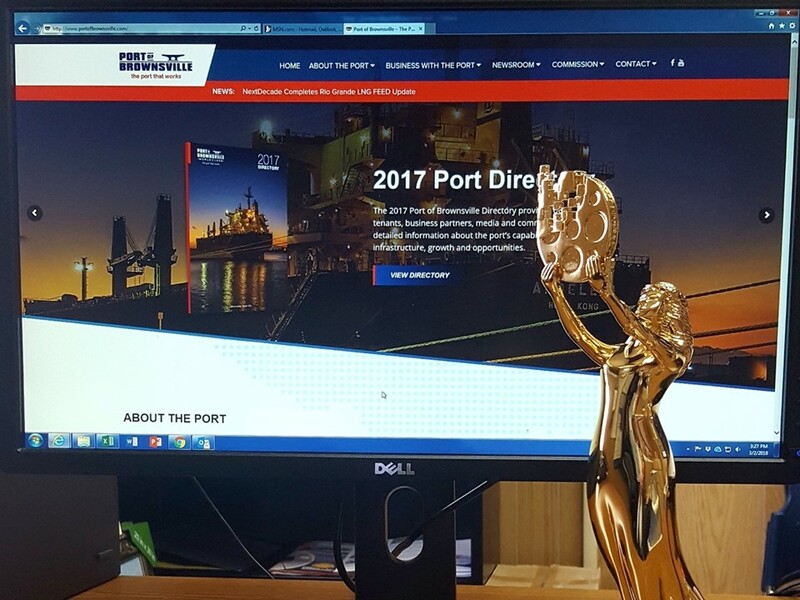 The port’s website, www.portofbrownsville.com, was honored with the 2018 AVA Gold Digital Award in the Web-Based Production category for government entities. The site, redesigned in 2017, is an improvement from the previous version and features a cleaner and more visually impactful design, providing visitors greater detail and information about the port. It also features enhanced content for marketing, media relations and public information. The site also includes information about the Brownsville Navigation District Board of Commissioners, meeting agendas and minutes, and important contact information. The port’s e-newsletter, Port Matters, received the 2018 AVA Honorable Mention in the Interactive Communication category. Port Matters is a by-monthly publication featuring stories and trends related to the Port of Brownsville and the maritime industry. The e-newsletter also includes a calendar of events, videos and other multimedia related to the port. The AVA Digital Awards are sponsored and judged by the Association of Marketing and Communication Professionals, which consists of several thousand production, marketing, communication, advertising, public relations, and free-lance professionals. The Port of Brownsville’s website was honored with the 2018 AVA Gold Digital Award in the Web-Based Production category for government entities.